If you’re an iPad(s aapl) user who wants to use the new Microsoft(s msft) Office on your tablet, here are a few things you should know. First, if you want to create and edit documents as opposed to just viewing them, you need to pay up for some sort of Office 365 subscription — at about $100 per year. Fair enough. Second, if you depend on custom macros — many of which may have been written before you started your job — you’re out of luck. Those macros will not run on Excel for iPad. 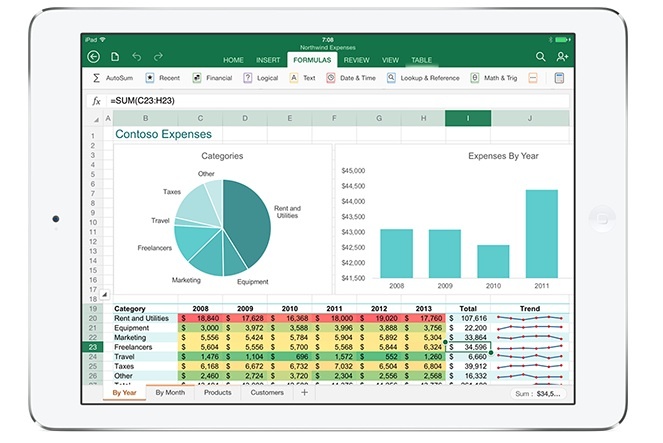 Third, if you’re a fan of pivot tables, which let you slice-and-dice your spreadsheet to get a different view of the data, well, you can view them but not create them on Excel for iPad. Finally, if you want choice about where to put your Office-for-iPad document, you have exactly one cloud option: Microsoft OneDrive. That may be an issue for the millions of Box and Dropbox users out there. For consumers as with developers, cloud storage has become the hook vendors use to draw customers into their respective lairs -er clouds. Microsoft has positioned OneDrive as the anointed repository for those Office for iPad documents. Someone has come up with a workaround to let savvy users save their documents to Alfresco, but it’s not exactly intuitive. What this shows that even as Microsoft fights to show that its Azure cloud is open to all sorts of third-party products and tools — the new Portal Preview incorporates third party options on screen for developers — that openness only goes so far. Cloudera CEO Tom Reilly susses out a bit more on the the company’s monster ($900 million) round of financing from Intel(s intc) and others. Microsoft Azure embraces external technologies. “True” except for the part where you can save to any SharePoint server and that OneDrive and OneDrive for Business (i.e. cloud SharePoint) are not the same thing at all. Not so much untrue words, but as comments have already noted, apple products only work with iCloud, Google only with gdrive. And no alternative offers the functionality of the desktop copies of office included in the subscription you fail to expand upon, so not exactly a complete report on the topic here. And again as commented already, azure platform isn’t document storage. Can’t host servers on dropbox, should there be an article decrying this too? Not a single untrue word, but as comments have already noted, apple products only work with iCloud, Google only with gdrive. And no alternative offers the functionality of the desktop copies of office included in the subscription, so not exactly a complete report on the topic here. Azure’s IaaS and PaaS platforms are quite different from storage (OneCloud). Azure is being used to host Windows sites and also Linux sites. I believe office integrated with OneCloud to provide document syncing, sharing, allowing more than one user to edit a document at the same time, etc. Huh, you mean a software provider not allowing interaction with other company’s services? Now where have we heard this before? Oh yeah, Apple & Google. So in other words, it’s a de-facto industry standard? So maybe you should be railing against everyone and not singling out Microsoft? this story is about microsoft, not everyone else. And the fact that Microsoft is positioning itself as great for partner ISVs on Azure contrasts with this Office for iPad stance. Why don’t you write similar articles about everyone else, too? Or that would not align with your vested interests?? I write about vendor lock-in all the time. if you do a google search on gigaom and vendor lockin you’ll see stories about Amazon, Oracle, IBM — ALL the cloud vendors. Having said that, this story is about Microsoft at a time when it’s trying to show that it is a good partner to third party ISVs on hte one side (Azure) while locking them out on the other (Office for iPad). Any on Apple and Google since you really did go out of your way there not to mention those companies. Well I actually did a search and I have found Microsoft being negatively mentioned in a Google article. So Robert McLaws is correct, why not just say “such practices are the same at” Google and Apple. Like Google Docs, and Google’s App Engine. These don’t work with OneDrive or DropBox. So, what’s different here? Plus the $100 per year is for 5 users and includes full office on Mac and PC. The $99 Office 365 subscription is thrown out as if the entire amount is only for the iPad app, the pricing strategy makes sense given the multiple devices that most users now have and only one license would be used to activate “editing” on iPad. That would be $20 per iPad yearly subscription, not bad at all. Please direct me to the statement from Microsoft that says Every thing produced going forward will be compatible with all competing platforms. You have your answer from Microsoft, A Microsoft spokeswoman said the company designed Office for iPad â€œto work seamlessly with OneDrive and OneDrive for Businessâ€ . What part of this statement do you not understand. This may come as a suprise to you, but Microsoft is not obligated to satisfy you or me. Nothing is perfect, we have choices. Be an adult and make a choice, then move on. The market will dictate success or failure.